Talk to any personal trainer or fitness instructor and they’ll tell you to vary your routine. Not only does it keep your body aligned (different workouts focus on different muscles), but it keeps your mind engaged. As someone who consistently (and only) varies between running and yoga, I wanted to find something that was completely out of my comfort zone, both physically and mentally. 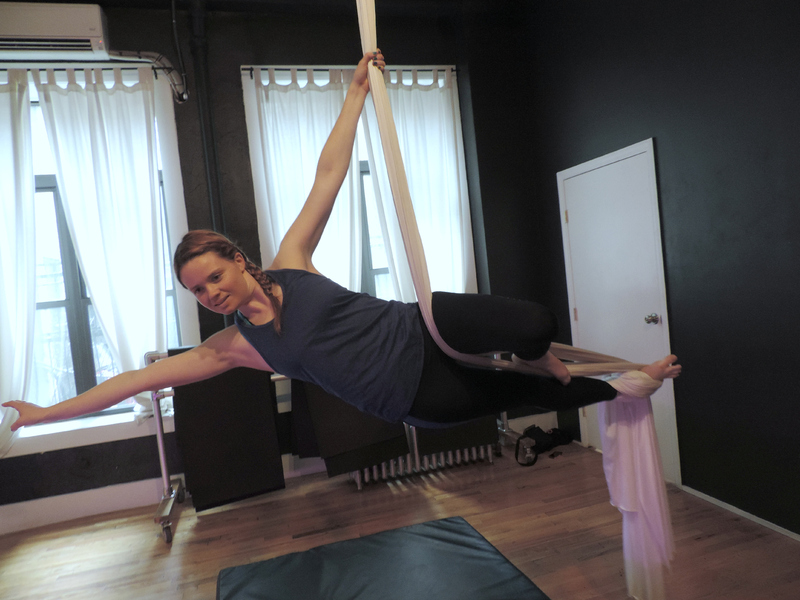 My choice: to spend an afternoon at an aerial fabric class at Body & Pole in Manhattan. Aerial fabrics is a type of performance where aerialists perform a sequence of acrobatic moves suspended high in the air using fabric as their only form of support. Think flying trapeze without swinging. To say it brought me out of my comfort zone and kept my attention would be an understatement. Moving upside down while clutching a piece of fabric was not just a great workout, but pretty damn exhilarating! If you’re nervous, don’t be: you don’t need to be in amazing shape, or a Cirque du Soleil-level acrobat to try the intro class. “We will make sure that you accomplish something in every class,” says Jen James, the Aerial Manager at Body and Pole. Since you are using upper body strength to either climb up the fabric or hold your body up, this shouldn’t be the first workout you try after a few years hiatus from the gym. Some basic strength is needed. Jen James teaches a class at Body & Pole. Photo: Shannon Farrell. When it comes to experience, the instructors don’t expect you to have it; obviously we all don’t have second lives in the circus! “There is a set of skills that students should be able to accomplish over time,” says Jen. With each class you learn new movements and gain experience, enabling you to progress into other levels. James went into detail on the basics during my intro class—on everything from how to tuck your pelvis under when holding onto the fabric to the perfect positioning of your hands on the fabric when gripping. A student demonstrates an upside-down aerial fabric move in class. Photo: Shannon Farrell. And the physical benefits are just as endless. “It’s a whole body workout that helps build upper body strength, core strength and increases body awareness and stamina.” Whereas a run feels like second nature, aerial opens up your body and moves you in ways you in new and exciting ways. Case in point: at one point I was upside down with my legs spread out to the sides. Nothing about this felt natural—but it was thrilling. My body was moving in ways I never thought it could. Even as a beginner, I was still able to accomplish some pretty cool things! Photo: Shannon Farrell. I implore anyone to give this type of workout a try—even if only once. Try something new. Release your inner performer. Challenge yourself. After all, isn’t exercise supposed to be fun?